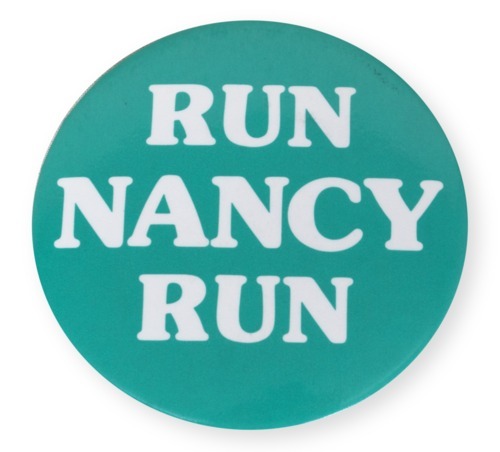 Campaign button for Senator Nancy Kassebaum that reads, "Run Nancy Run." In 1990, Kassebaum supporters wore these buttons to encourage her run for a third term in the United States Senate. The daughter of Kansas Governor Alf Landon, Kassebaum was born in Topeka in 1932. She served three terms in the U.S. Senate between 1978 and 1997. Randy Duncan of Western Associates in Salina, Kansas, produced the button in 1990.